Listed in May 2004, CapitaLand Commercial Trust (CCT) has established itself to be the largest commercial REIT listed on the SGX. 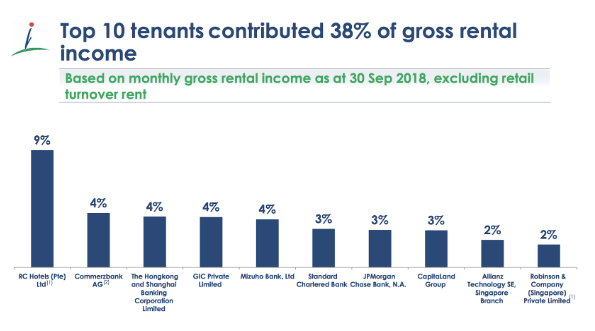 As at 30 September 2018, the REIT derives income from a portfolio of 10 commercial properties worth a total of S$ 11.1 billion. Presently, it remains one of the 30 constituents of the SGX. In this article, I’ll bring you its latest financial results, growth opportunities, and valuation metrics to assess CCT’s investment potential at its current unit price. 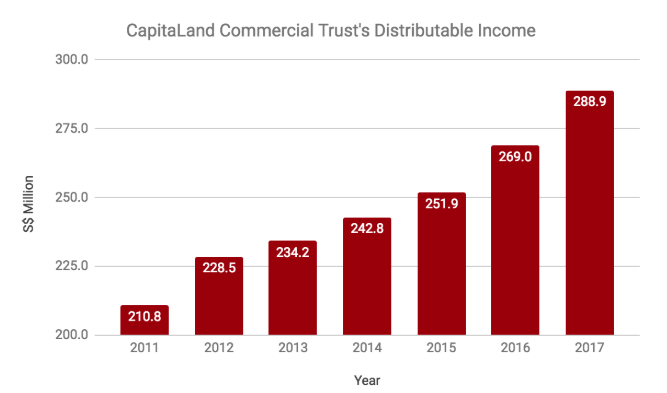 CCT has achieved consistent growth in distributable income for the last 6 years. It increased from S$ 210.8 million in 2011 to S$ 288.9 million in 2017. Hence, it had grown its distributions per unit (DPU) from 7.52 cents in 2011 to 8.66 cents in 2017. 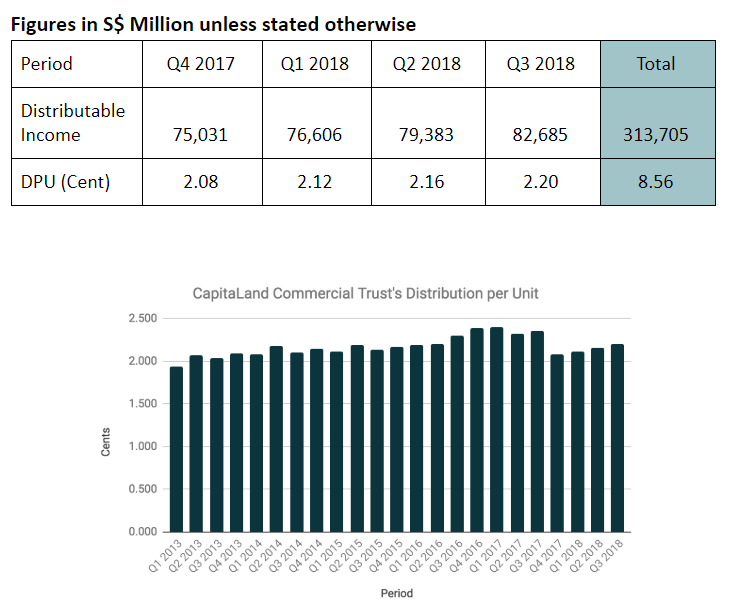 Its growth was contributed by the stable increase in profits from main real estate namely, Capital Tower, Six Battery Road and 60%-interest of Raffles City Singapore and the inclusion of CapitaGreen starting in 2015. 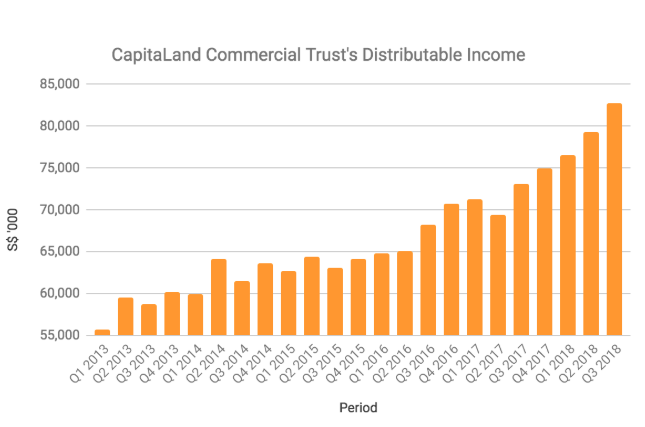 CCT’s distributable income has continued to increase in 2018. It is contributed from an inclusion of Asia Square Tower 2 which was acquired at the end-2017 and ongoing rise in profits from its key properties mentioned above in 2018. The 2 factors had offset its income loss from its disposal of Wilkie Edge, One George Street, and Golden Shoe Car Park recently. On 26 October 2017, CCT has completed its issuance of 513.5 million new units from a rights issue. These units were issued to finance CCT’s acquisition of Asia Square Tower 2 for S$ 2.09 billion. Hence, CCT’s DPU was adjusted downwards starting in Q4 2017. Since then, CCT had recorded slight growth in its DPU over the last 4 quarters. On 29 August 2018, CCT has completed its disposal of Twenty Anson for S$ 516 million, some 20% higher than its purchase price of S$ 430 million in 2012. CCT has utilized its disposal proceeds to repay its debt, thus, reducing its total gross debt from S$ 4.40 billion in Q2 2018 to S$ 3.91 billion in Q3 2018. Hence, CCT’s aggregate leverage has dipped from 37.9% in Q2 2018 to 35.3% in Q3 2018. Presently, its average cost of debt is 2.6% and has been given a stable BBB+ outlook in its credit rating by Standard & Poor’s. As at 26 October 2018, it has 92% of its borrowings based on fixed interest rates, thus, is lesser impacted by an increase in interest rate as compared to REITs with higher percentages of borrowings on floating rates. On 17 May 2018, CCT made its first investment beyond Singapore by acquiring 94.9%-interest in Gallileo, a freehold prime Grade-A Commercial Property that is located in the prime CBD area of Frankfurt, Germany for S$ 540.7 million. 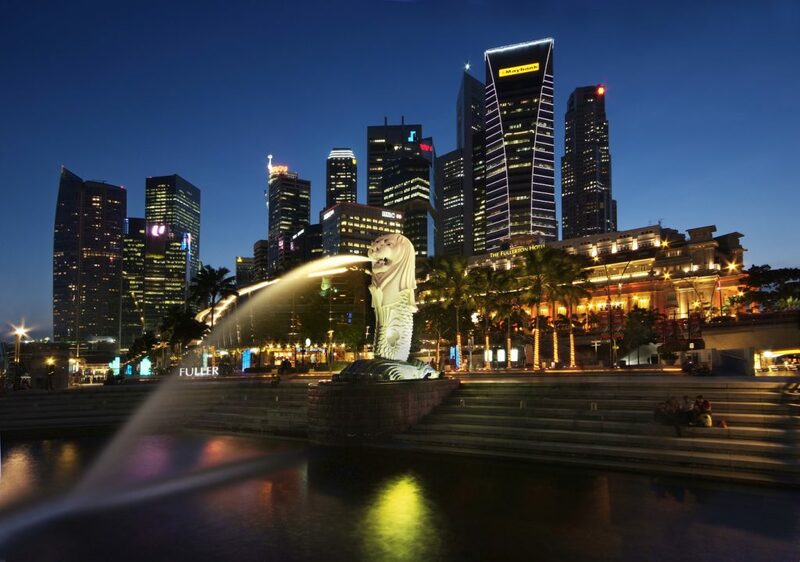 The move is strategic as investment opportunities in Singapore are now limited with 72% of Grade-A office buildings in the core CBD area of Singapore are now owned by either REITs or developers listed on the SGX. 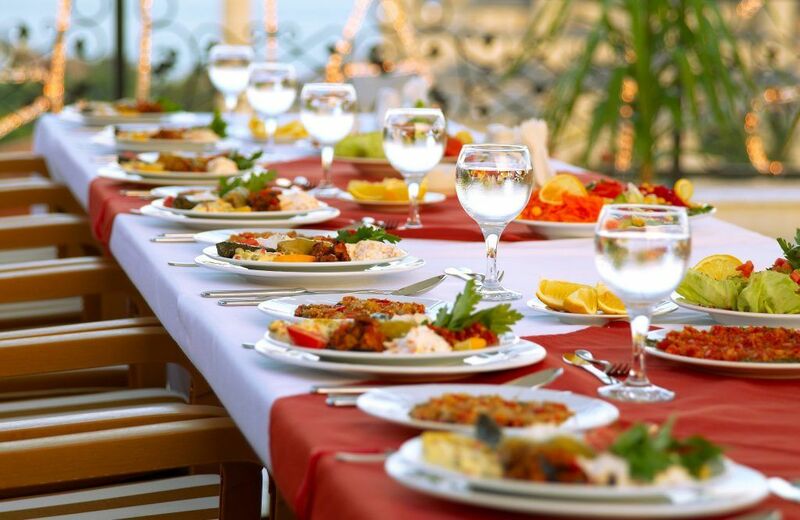 In the coming years, it plans to have 10% – 20% of its portfolio in overseas properties. Presently, Gallileo is occupied by Commerzbank AG where its current lease will expire in 2029. The rent is adjusted based on an inflation index every two years once. Commerzbank AG is a leading commercial bank which is 15.5%-owned by the German Government. It has become the second largest income contributor to CCT as at 30 September 2018. On 13 July 2017, CCT has entered into a Joint Venture Agreement to redevelop Golden Shoe Car Park with CapitaLand and Mitsubishi Estate. CCT would hold a 45% stake in this joint venture. It would be transformed into CapitaSpring, a 51-storey integrated development comprising of Grade-A office, 299-room serviced residence, and retail centre. It is estimated to cost S$ 1.82 billion to redevelop the property. Out of which, the investment portion for CCT is budgeted to be S$ 819.0 million. As at April 2018, JP Morgan has committed a total of 155,000 sq. ft., equivalent to 24% of office net lettable area (NLA) of CapitaSpring. Thus, JP Morgan would be an anchor tenant to CapitaSpring upon the completion of its redevelopment in 1H 2021. 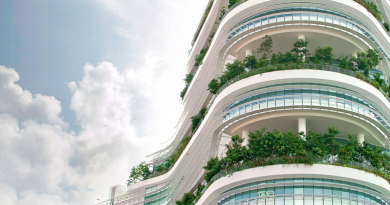 CCT was given a call option to acquire the remaining 55% stake in CapitaSpring from CapitaLand and Mitsubishi Estate at any time for a period of 5 years after temporary occupation permit (TOP) of the new development has been granted to CapitaSpring. As such, the call option itself presents another opportunity for CCT to grow its portfolio in the mid-term. From Point 2, CCT has paid out 8.56 cents in DPU over the last 4 quarters. Thus, its gross dividend yield is 4.86% per annum, closer to its 5-Year lowest dividend yield of 4.49% recorded in 2017. As at 30 September 2018, CCT has reported net assets of S$ 1.81 an unit. Thus, its current P/B Ratio is 0.97, higher than its 5-Year P/B Ratio Average of 0.93. CCT has built a track record of growth since 2011 and has kept occupancy rates for its portfolio at 99.2% as at 30 September 2018. With the recent inclusion of Gallileo, CCT will derive its first full financial results from it starting in the year 2019 and thus, contributing to its income growth in years to come. I believe, the issue with investing in CCT’s units arises when investors compare its gross dividend yields with other S-REITs. 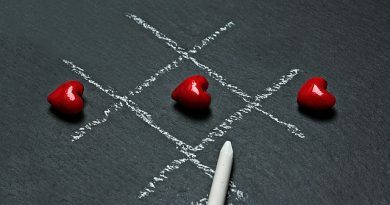 After all, it is common to find REITs that pay out a decent 5% – 7% in dividend yields presently. Hence, a decision to invest in CCT’s units or otherwise lies in your level of acceptance in terms of its dividend yields, portfolio quality, and growth prospects in the future.